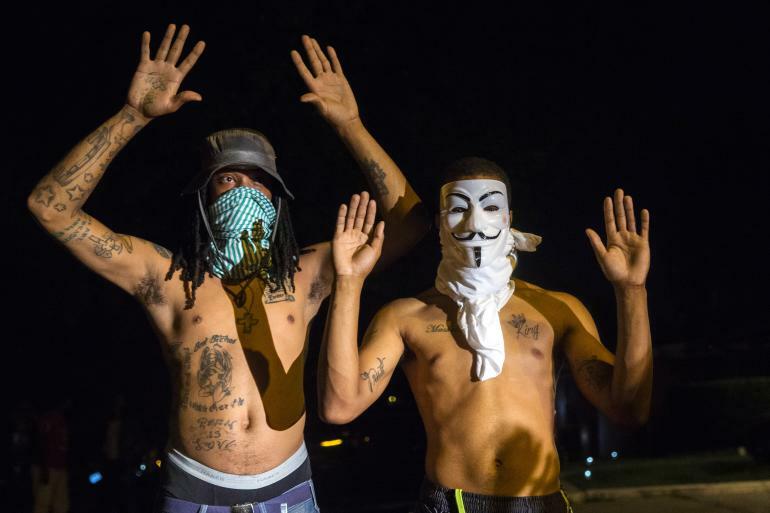 After the Killing of Michael Brown, Anonymous leaked videos, and evidences against that Police Officer, who shot down the Michael. 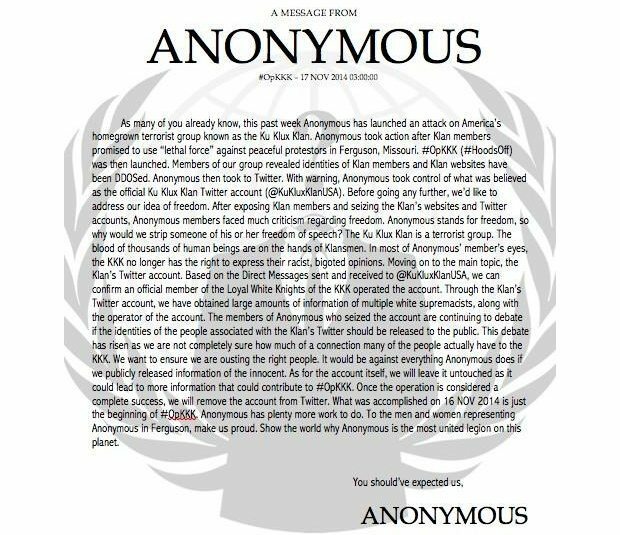 After the hack of the twitter accounts of the KKK, it officially announced to shoot anyone wearing a Guy Fawkes (Anonymous) mask. Let’s try to learn about What is going on? We are not attacking you because of what you believe in, as we fight for freedom of speech. 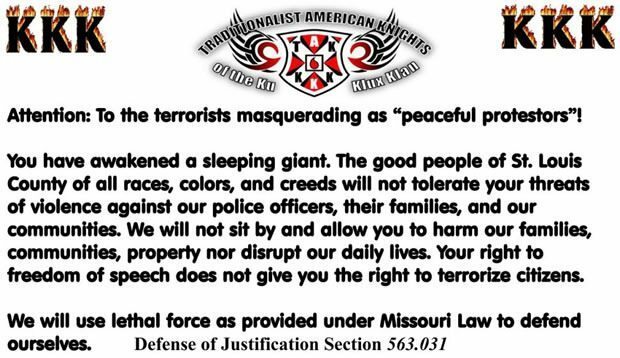 We are attacking you because of your threats to use lethal attacks against us at the Ferguson protests. Due to your actions we have started Operation KKK. The aim of our operation is nothing more than Cyber Warfare. 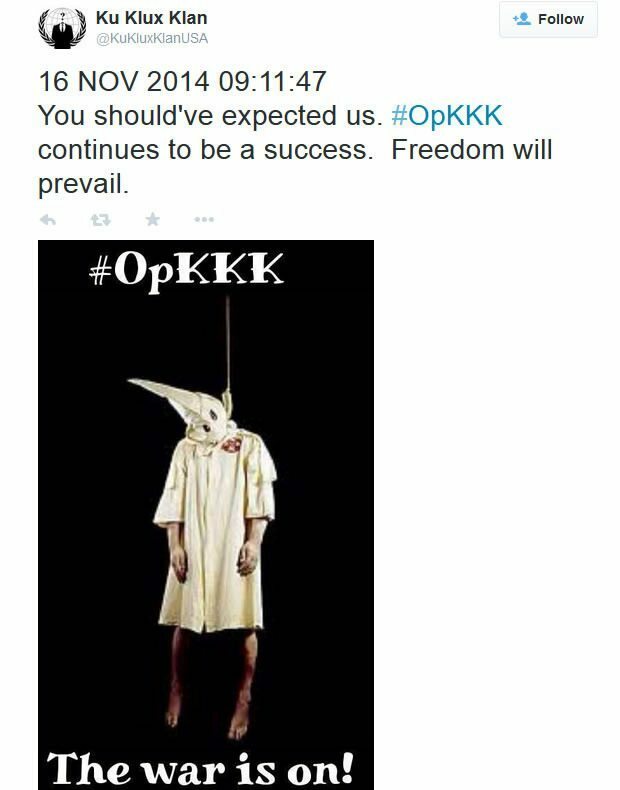 Anything you upload will be taken down; anything you use to promote the KKK will be shut down. DDoS attacks have already been sent and have infiltrated your servers over the past 2 days… d0x’s have also been launched on leaders of the KKK. All information retrieved will be given to the public. You messed with our family and now we will mess with yours. After sites came up, the Missouri KKK leader Frank Ancona begged for donations from other members. As I already talked above about the leak of Anonymity of the KKK members by Anonymous was done, which includes seizure of online accounts, releasing email accounts, and “unhooded” some in the KKK by releasing the identities via links to social media accounts which contained KKK members’ photos, addresses, phone numbers, ages, workplaces and even photos of their kids. What you think about this Cyber War, Must tell us in comments.